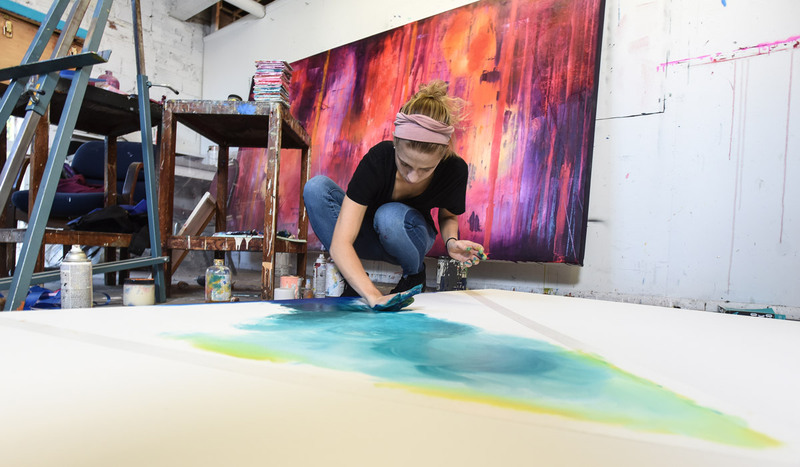 All first-year students admitted to the Studio Art and Art History majors at Catholic University are eligible to compete for the Karen Laub-Novak Art and Faith Scholarship. Up to two students each year who demonstrate exceptional creative talent, will be selected to receive a $5,000 renewable scholarship (a total scholarship of $20,000) and up to $6,500 financial support for research, travel, museum admission, arts events, or other forms that may serve to advance their formation as creative and productive students of the arts. Each scholarship recipient will also have the support of a special mentor. To be considered for a scholarship, students must be admitted the Department of Art as either Studio Art or Art History majors, and must submit an online portfolio and an essay expressing how they wish to explore their Catholic faith and formation through art and artistic expression. Finalists will be interviewed by Catholic University faculty (in-person or via Skype). Students interested in exploring their most profound creative potential in a dynamic arts community nourished by centuries of spiritual inspiration and the unparalleled resources of the Nation's Capital in a welcoming and supportive academic environment are encouraged to apply. A portfolio of 10-15 pieces of your best original work of any type or medium may be submitted. Please submit scans or photos of original artwork as JPG images (up to 5MB each, with a minimum of 800 pixels wide). Video files may be submitted as MP4 files (up to 60MB each). Video files must be no longer than 3 minutes each, use excerpts if needed. For sculpture or installation, you may submit multiple views of a single piece, however the total number of images or video cannot exceed 15. Students with an interest in Art History should upload an exemplary writing sample of 1,500 words or less on a topic related to art, art history, or art criticism saved as a .pdf or Word document. Additionally a 1-2 page, double-spaced essay in 12pt typeface must be uploaded as well. This essay should express how you wish to explore your Catholic faith formation through art and artistic expression. Please visit our Portfolio Submission Portal.